1. Fill out your profile. Complete your profile so like-minded writers can connect with you. There’s no better place to introduce yourself as an author. Important: Make sure to confirm your email preferences. 2. Create your novel starting in September. In order to update your word count in November, you need to give your novel a title (don’t worry, you can always change it later!). You cannot write your novel on our site, but you can share a short synopsis and excerpt. Announce your 2018 NaNoWriMo novel now. Choose a home region to get updates on local events from your volunteer Municipal Liaison. Once you’ve selected your region, your Regional Lounge will appear with the forums. 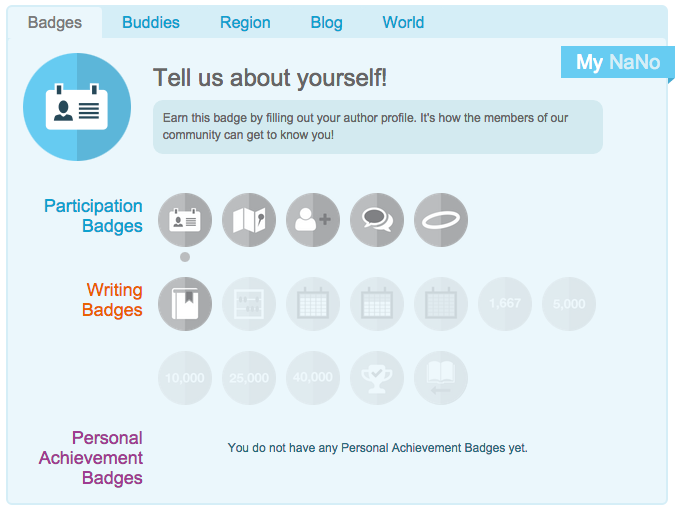 Earn participation and writing badges by completing specific milestones. Award yourself personal achievement badges to celebrate the peaks and valleys of your personal creative journey. We have plenty of resources to spur you on, including pep talks from published authors, NaNo Prep advice, and more. Starting on November 20, paste the full text of your novel into our word-count validator to win. Find out more about how to win. See the FAQs for more logistics. Connect with us. We’re on Facebook, Tumblr, Twitter, YouTube, Instagram, and Pinterest.